-Colours:3 different colors according to your preference. -Length:Cut approximately 60 to 65 inches or longer depending on your wrist size. To be on the safer side, stick to longer strings because they're much easier to work with. But don't cut them too long, that'd just be a waste of string. 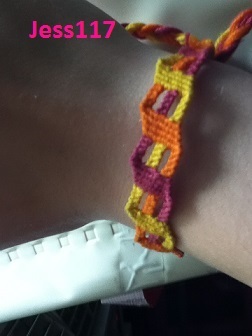 For this bracelet I will be using the colours blue, teal, and cream. Start off with your middle most colour which is cream for me. 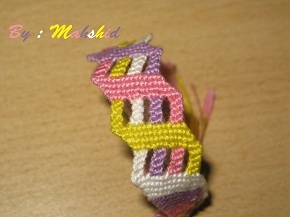 Take your right most string of the cream colour and make 4 forward knots onto the remaining strings going to the right. Pick up your next string in line which is the 2nd string of the cream colour and do the same as the previous step, making 5 forward knots this time. After you've used up all your cream strings you will have something that looks like this. Now take your next string in line, ie the right most string of the colour blue (for me), and make forward knots on all the remaining strings. Now were going to work on the Bars. Were going to work with the teal first. Take the right most string of teal colour and make 3 backward knots on the remaining strings. Time to work on the cream colour. And finally time to work on the blue. Do 4 rows of backward knots and you will see while you're working with your blue you will have your first shaped zig which gives the zig zag shape to the bracelet. Time to work on the division. This is basically repeat step 1 instead were tying it on all strings consequently making 4 rows. Take your far left string which is the teal for me and make forward knots on all the remaining strings. This is how it looks when you link it with the other colour. You don't have to put much effort on it. They align themselves at their own pace. Now after doing the division part, you're basically going to repeat step 7 again, by making the bars. Keep repeating from step 7 Until you reach desired length. Next your going to take the far left string and make 7 forward knots to the right. Cheers & Have a Great day! The original author of this tutorial is , but it has also been edited by Foz, piggyfan2, ririttt, Kestrel, Alicat, KnotterHolic, kleinevos, chanisarak, EmmaLiz44, DogsAreCool2325 and abir. The tutorial was last updated 3 years ago. Click here to upload photos of your work!